Rooney fired in a record 53 goals for England. Wayne Rooney is set to come out of international retirement for England’s friendly against the United States later this month to mark his contribution to the national team. It is understood Rooney – who is England and Manchester United’s record goalscorer – will feature for Gareth Southgate’s side in a one-off appearance on November 15. The 33-year-old, now playing in Major League soccer with DC United, has not played for England in almost two years, but the match at Wembley a week on Thursday is set to be his 120th senior appearance in an England shirt. The match against the US is also expected to raise money for the Wayne Rooney Foundation, and will provide England supporters with the chance to give the country’s all-time leading scorer a proper send-off. It is understood Rooney’s involvement with England for the fixture will be made official in the coming days. Rooney, the former United and Everton forward, who scored 53 goals for the Three Lions, announced his retirement from international football in August 2017. He has scored 12 times for DC United since he joined the MLS side from Everton last summer, taking them from the bottom of the MLS to the play-offs. 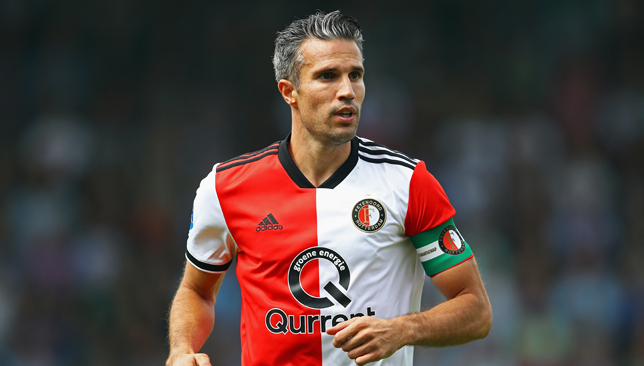 Veteran Dutch forward Robin Van Persie expects to retire at the end of the season. The 35-year-old is currently back at Feyenoord, the club with whom he came through the youth ranks before moving to Arsenal in 2004. Van Persie went on to win the FA Cup with the Gunners before leaving to join Manchester United. He then helped fire Sir Alex Ferguson’s team to the 2012-13 Premier League title. With 50 goals across 102 appearances for Holland, Van Persie was part of the Oranje side who reached the 2010 World Cup final, losing to Spain, and he also captained the squad which finished third four years later. Van Persie moved from Old Trafford to Fenerbahce in Turkey in July 2015 before returning to his homeland in January and helping Feyenoord win the KNVB Cup. In an interview with Dutch media outlet AD, Van Persie confirmed his intention to make the current campaign his last as a player. “When do I have to stop? That is normally at the end of this season,” Van Persie said. Van Persie felt he had “lost the fun” while in Turkey, but hopes to enjoy his swansong back at De Kuip. “I also do not see that my return to Feyenoord is only successful if we take the national (Eredivisie) title,” the forward said. “When it is successful? That is actually it. Van Persie continued: “That pleasure has returned (now I am) at Feyenoord. I want to win as a football player. “The cup win was nice, but not the measurement of being successful or not. I wanted to give something back, to share my experiences. “I try to help my fellow players. I see it broader than just lifting a trophy or not. That is the goal, and that is what the club management also says. The latest round of international fixtures threw up some thrilling, unexpected results, especially in Europe and the UEFA Nations League. It was a good week for the Netherlands, but their counterparts Spain and Germany have plenty to worry about after a few disappointing results, while England’s resurgence continued and there were shock wins for one of the continent’s usual minnows. Here’s a look at the winners and losers of the latest international break. There are cases for several individual figures from the Three Lions side to make this list – Raheem Sterling ending a three-year scoring drought, Marcus Rashford playing with a vim that’s been spotted only occasionally in Manchester United colours recently, Gareth Southgate getting the first signature win of a managerial career that already included leading England to the World Cup semi-finals – which is why it’s just easier to put the whole team here. Nobody would have expected a win of any kind on Spanish soil, let alone one in which they were 3-0 up at half-time having utterly destroyed a team that has aspirations of being called the best in the world again. England’s national team hasn’t been this exciting and noteworthy in over two decades. Le Oranje are back. Beating Germany is always a big statement for the Dutch, even if the version they faced over the weekend is a lost, broken team. It was still a dominant win over a team that won the World Cup four years ago and the Confederations Cup last year, not to mention reaching the semi-finals at the last European championships. The result was a massive confidence boost for Ronald Koeman’s side, and it showed as they held their own in a 1-1 draw against Belgium on Tuesday, a creditable result playing away to the third-place finishers at this year’s World Cup. Things are looking up for the Dutch again. What a week it’s been for one of Europe’s much-derided minnows. Gibraltar had won just once in their history before the start of this year, and even the March win over Latvia was in a friendly. They’d never won a competitive fixture. Now they’ve won two in a week. Gibraltar beat an Armenia side that was captained by Arsenal star Henrikh Mkhitaryan on Saturday in the Nations League, then topped that 1-0 victory with a 2-1 win over Liechtenstein four days later – the first time they’d ever scored more than one goal in a game. As things stands, they actually have a decent shot of qualifying for Euro 2020 – they’re three points behind group leaders Macedonia. The Germany manager’s job is hanging by a thread. Die Mannschaft lost both of their Nations League fixtures during this international break, to Netherlands and then France, the first time they’ve lost back to back competitive games since 2000. Their 3-0 loss to the Dutch was their worst in the history of that particular rivalry. They’ve won just twice in 11 games this year, only once in a competitive fixture. Low is trying all he can, from handing out caps to unheralded players to experimenting with his formations, but nothing’s working. That’s usually a sign that the jig is up. Germany have lost six games in a calendar year for the first time in their history. Spain had scored 12 goals in three games under Luis Enrique, were unbeaten in 28 games – they were knocked out of this summer’s World Cup on penalties, having not lost a game – and hadn’t lost at home since 2003. They weren’t supposed to lose against England, of all teams. But not only did they lose, the 3-2 loss in which they were down by three goals at half-time exposed familiar weaknesses. The way England tore through Spain on the counter-attack with their pace, and turned the hosts’ high defensive line against them, was eerily reminiscent of La Roja’s infamous 5-1 loss to the Netherlands in the 2014 World Cup. Enrique may be preaching evolution not revolution, but at the moment the former world and European champions aren’t even evolving. Goalkeeping howlers are a common enough occurrence – just ask Loris Karius. But three in one game? Macedonian keeper Stole Dimitrievski was directly responsible for three of the four goals his side conceded in a 4-0 loss to Armenia on Tuesday, a collection of howlers that had some fans even wondering if the game was fixed. Whether it was something that nefarious, or just a particularly poor performance, Dimitrievski certainly had a night to forget.